Manila (VNA) –Deputy Prime Minister and Foreign Minister Pham Binh Minh has stressed the need for ASEAN 3 (ASEAN and China, the Republic of Korea and Japan), the East Asia Summit (EAS) and the ASEAN Regional Forum (ARF) to promote cooperation on the basis of ensuring ASEAN’s central role. The move aims to contribute to tackling regional security challenges and tightening connectivity in the region, the official said at the 18th ASEAN 3 Foreign Ministers Meeting and the seventh EAS Foreign Ministers’ Meeting in Manila, the Philippines, on August 7. The events took place as part of the 50th ASEAN Foreign Ministers’ Meeting and related meetings. Applauding progress the ten-member group and its partners have made, FM Minh called on the partners to continue helping ASEAN achieve goals towards building the ASEAN Community 2025. Regarding future cooperation, he suggested ASEAN 3 focus on trade, finance and intensifying capacity and regional connectivity, prioritising the development of micro, small and medium-sized enterprises. 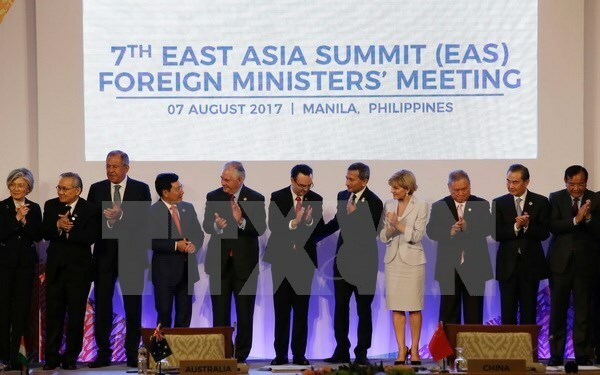 At the EAS Foreign Ministers’ Meeting, Minh said ASEAN should carry forward its central role and consider maritime affiliation a new cooperation priority of the EAS. At the 18th ASEAN 3 Foreign Ministers’ Meeting, the delegates said ASEAN 3 has become a dynamic and effective cooperation framework, contributing to peace, stability and development in East Asia. They lauded ASEAN 3’s recent fruitful collaboration, especially in implementing the ASEAN Working Plan for 2013-2017 and action plans on the recommendations of the East Asia Vision Group II. Participating countries underlined the significance of cooperation in stabilising regional finance and showed their support for free and equal trade, mentioning negotiations for the Regional Comprehensive Economic Partnership and the enhancement of the role of the Chiang Mai Initiative Multilateralisation Agreement in the regional financial network. The FMs agreed to step up partnerships in coping with global challenges such as food security, energy, climate change, natural disaster management and diseases, while implementing initiatives in connectivity, sustainable development, narrowing development gaps and tourism cooperation. They approved the Working Plan for 2018-2022, which will dictate ASEAN 3 cooperation for the next five years, and discussed preparations for a summit marking the 20th anniversary of ASEAN 3 scheduled for November 2017. At the seventh EAS Foreign Ministers’ Meeting, the ministers reiterated the role played by the EAS as a forum for leaders to debate strategic issues and promote cooperation in maintaining peace, stability, security and development in the region. They praised the EAS’s efforts in implementing the six priority areas of energy, education, finance, health care, natural disasters management and connectivity, as well as measures to strengthen the EAS set in the Kuala Lumpur Declaration on the celebration of the 10th anniversary of the EAS. They also commented on the outcomes of decisions from the 11th EAS in September 2016 and the action plan on implementing the Phnom Penh Initiatives for 2015-2017. The participants agreed to foster affiliation in the six priority areas, set forth a new action plan and consider expanding priority cooperation areas in maritime issues, terrorism combat and non-proliferation of nuclear weapons. On the occasion, the FMs candidly discussed regional and international issues of shared concern, which have directly affected peace, security and stability in the region, with the most noteworthy being the situation in the East Sea and the Korean Peninsula, and new security challenges like terrorism and cyber security. Peace and security are prerequisite conditions for cooperation, development and prosperity in and outside the region, they said. Regarding the East Sea, they expressed concern over recent developments in the sea, including unilateral activities such as militarisation and construction on disputed islands. Stressing the importance of maintaining peace, stability, navigation and overflight security and safety in the East Sea, the FMs called on relevant parties to deal with disputes peacefully, exercise restraint, not to use force, respect international law and the 1982 UN Convention on the Law of the Sea, and fully and effectively realise the Declaration on the Conduct of Parties in the East.